Perhaps one of the most famous "fundamental" theorems in mathematics are the Fundamental Theorems of Calculus that are first introduced in an introductory calculus course. There are two parts of the fundamental theorem. We will first derive the Fundamental Theorem of Calculus Part 1 which we will call the Fundamental Theorem of Riemann Integral Calculus Part 1. 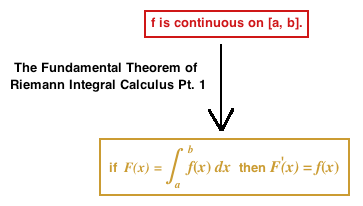 We derive The Fundamental Theorem of Riemann Integral Calculus Part 2 subsequently. Theorem 1 (The Fundamental Theorem of Riemann Integral Calculus Part 1) If $f$ is continuous on $[a, b]$ and $F(x) = \int_a^x f(x) \: dx$ then $F'(x) = f(x)$ on $[a, b]$.